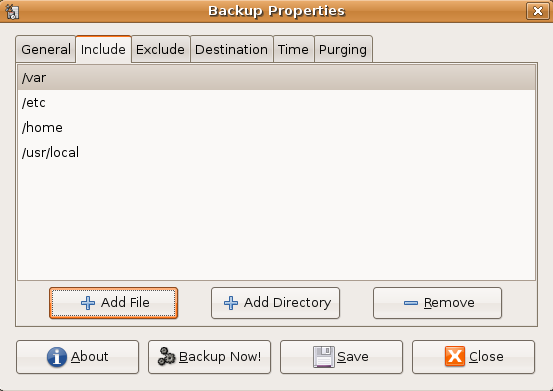 Now we will see a easy backup and restore tool called "sbackup"
SBackup is a simple backup solution intended for desktop use. It can backup any subset of files and directories. Exclusions can be defined by regular expressions. 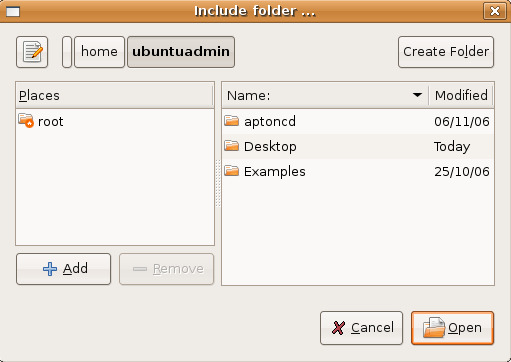 A maximum individual file size limit can be defined. 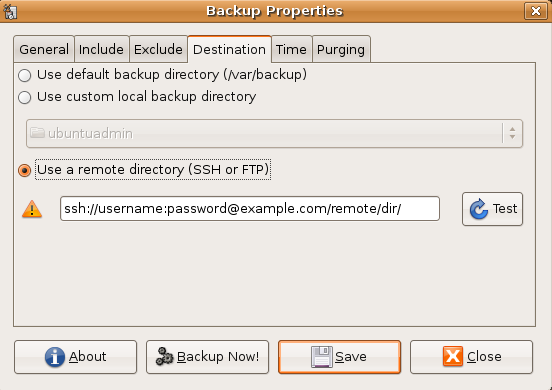 Backups may be saved to any local and remote directories that are supported by gnome-vfs. 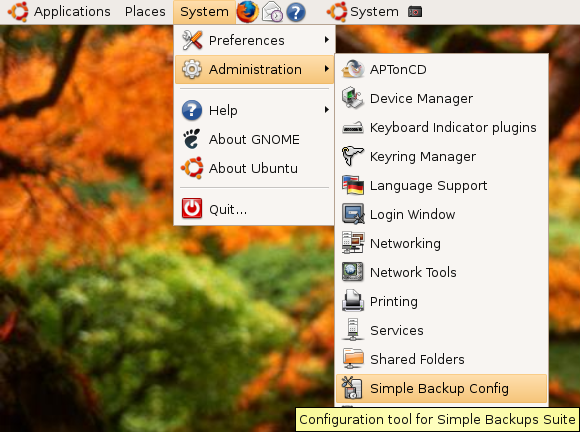 There is a Gnome GUI interface for configuration and restore. Once it opens the sbackup application you can see the following screen where you can configure your backup settings first tab is general options in this example i am choosing "Use custom backup settings"
This is same as the recommended backup and in this you can change the settings include,exclude files,you can change the schedule time. 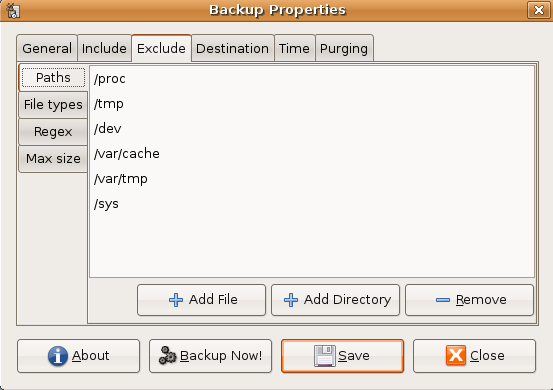 If you want to backup some files from time to time this option is for you and you can click backup now button to manually perform a backup according to the settings on the other backup properties dialog box tabs. 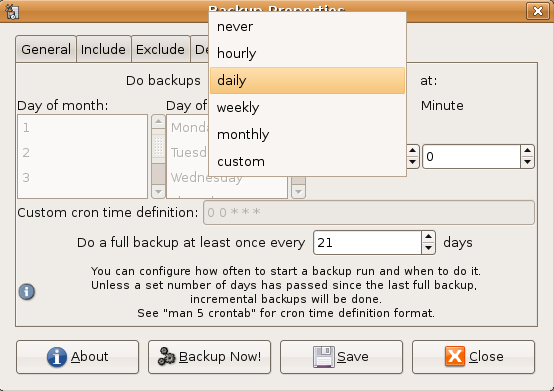 Now you can select "Time" option here you can schedule when do you want to run your backup. 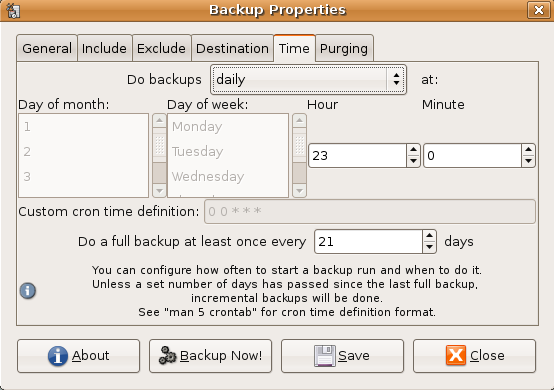 Next option is "Purging" here you can select old and incomplete backups and you set the no.of days you want to purge after completing all the settings you need to click on "Save" button to save your settings. Note:- By default Restored Files and Directories are owned by root this is because of sbackup will runs with root.You need to chnage these files or folder permissions using chmod or just right click and select properties of the file or folder. One more beauty about sbackup is you can store your backup on a remotemachine for this it will give the option of using SSH or FTP for this go to System---> Administration---> Simple Backup Config once it opens the application you need to click on destination tab here you can select "Use a remote Directory" option type ssh:// or ftp:// followed by the username:password, then @, then the remote host to connect to and the remote directory. Run "sudo srestore.py /var/backup/2006-11-18_03 /home/myuser /home/myuser/old". You can omit the last parameter to restore to the same directory. 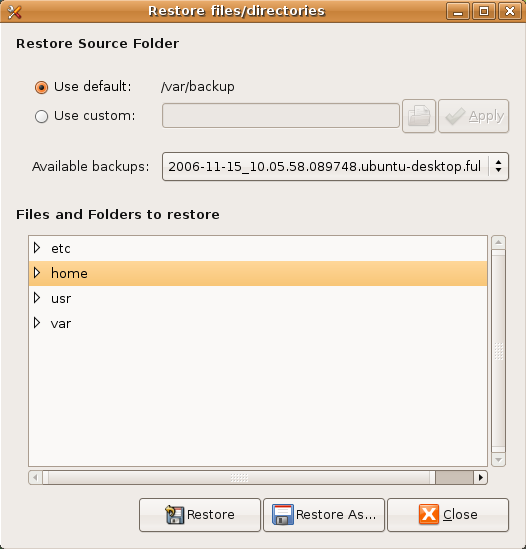 Looks like a great guide – just what I needed to backup my Ubuntu partition. Question? 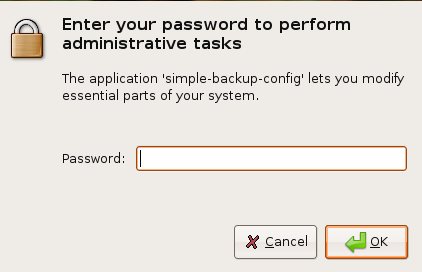 Now that I have configured SBackup and started to do a backup, to another partition, what will happen if my Ubuntu crashes and I need to restore it. Will I be able to restore it using the Live CD?, or perhaps thru Sabayaon which I have on another partition? regards and thanks for the guide! then you have a one click install of all your software again. I just backed up my Edgie installation and it worked fine once I had finally figured that I had to save the configuration. (I finally read what was right there in front of me!) Would there be any possible way to have some sort of indicator on the gui to show the backup is actually taking place and a notification that the backup is done? OK, I would like to save the backup to an external location (CD/DVD/USB hard disk, etc) but the destination tab doesn’t seem to support this. Any thoughts? Under the Destination tab, select custom local backup directory. Then click on the drop-down, select other, and browse to your custom location. However, there is only “root” folder. I can’t leave that in order to select the external usb hard disk. I like to backup directly to there. How? Is there a way to do a full backup by default instead of Incremental ? > Windows programs, I plan on getting a laptop and running Linux only. > English explanations would be much app. Another tool that is even simpler to use, I think, is grsync, which will mirror your selected folder(s) to a different location. The thing that I like about grsync is that there is ever only one place and one backup to restore from. So I am sitting in the livecd restoring a backup made with sbackup. I lost my entire /home partition due to a power loss while i was moving a partition. One huge drawback is that if you pick the latest backup, and it doesnt happen to be a full but instead only an incremental, it only restores those files. 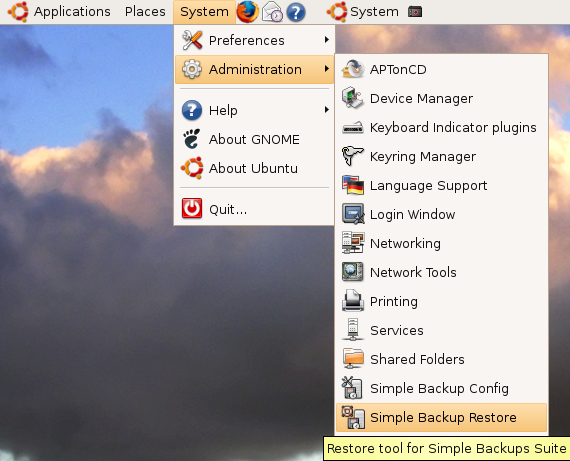 There is no option to restore back to all of the files you had on a certain backup day. So I am having to restore the last full backup, and then restore each incremental over top of the last. It is going to take a while…. I really want something like norton ghost that will backup all my files while keeping permissions. So the permissions and ownership of the backed files and directories are changed? And then to be restored manually? How is one supposed to do that when a very large number of files are involved? I have restored a whole directory of apps, and now I am having great difficulty trying to get them to work because of the changed permissions/ownerships. Any help and/or suggestions will be welcome. I can’t come to terms just how painfully slow sback is on a restore! I needed to recover a single text file from a back up. FOUR HOURS to recover it from a 50G archive. Useful guide to make sure I’m doing this right, thanks! Now once you have that first browse box in custom local open select “other” you can the select anyplace you want.. go to where your removable media was mounted. Often it is mounted in /media. Yes, Go to the “time” tab and set “Do a full backup at least…” to 1 day. …I really want something like norton ghost that will backup all my files while keeping permissions. Anyone know of something like that? There are more than a few answers. 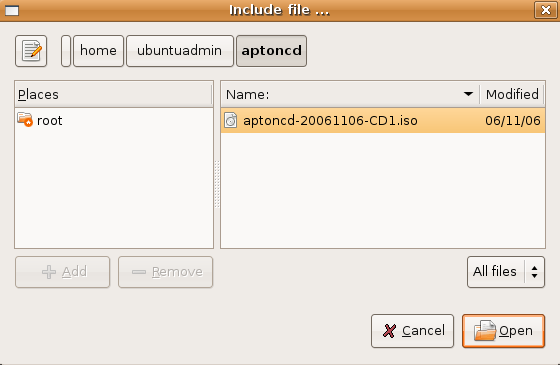 If you want something that makes drive or partition images like ghost and Acronis True Image (better than ghost IMHO) take a look into gddrescue or dd to make a image copy of the partition. There are several other backup packages that will schedule the backups also… sorta depends on where you want the backups to go. BackupPC (network disk), Rdiff, Amanda… but these are more geared to multiple machine backups. With enough googling you could probably find a script that somebody has written that will use rsync to make scheduled backups… SysAdmins used to to it all the time. The “p” option in tar says “preserve”. I wonder if you couldn’t stick a “p” between the “z” and “S” to become “tar -czpS”. Anybody know how to contact author or maintainer so I could they could tell me why it’s not that simple? …Any help and/or suggestions will be welcome. Often a directory will have pretty much the same permissions through out so you could just do a recursive chmod or a recursive chown with the “-R” option on either. So you could go one directory above the one you restored and set permissions with something like: “chmod a+rw -R restrddir” to set all the files in and below restrddir to read/write by all. You can also do wildcards such as “chmod a+x *.sh” to make all bash scripts executable. 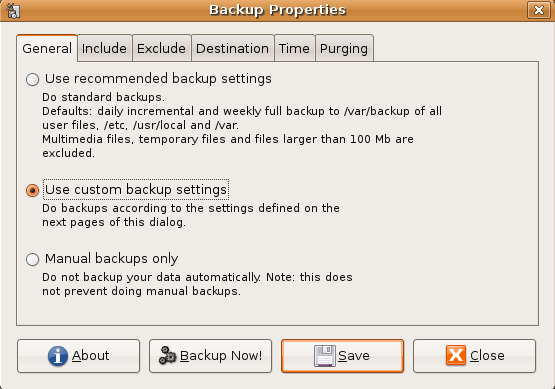 Oh yea, Jerad/others… some other options you might look at… backerupper, quickstart, pybackpack, etc… take a look at http://www.ubuntugeek.com/category/backup. Later this week I should have some time to test making the hack to sbackup so it preserves permissions. If it works I’ll post back here with link to download the modded code. Anyone know where or how to make sbackup produce a logfile of what it did when? Thanks for this very useful guide. This really helped me simply back up!! Don’t do this if you want a reliable backup! I agree. It let me down big time recently. Corrupted archive file (no EOF marker). Until such time as it provides automatic backup file verification sbackup should only be used as a second or third tier strategy. backing up the necesary data indeed is relatively simple using sbackup. But restoring data onto a new harddisk that only contains Linux as OS could be more complicated. My assumption is that i have to restore/transfer the data onto a new pc. Maybe someone can let me (us) benefit from his of her experience. Other than that it is a great way of explaining the workings of a piece of software by using images instead of just text. I installed sbackup and then didn’t immediately modify configuration or run the app. And experienced a doosey, which I couldn’t attirbute to a rouge process or ¿virus? – it wasn’t a virus… YEAAA Linux! Please ensure you have /var/backup as a valid folder, since the destination tab uses it as a default. I didn’t! in my dist (8.10). It was /var/backups on my laptop. sbackup then chose /var/archive since it couldn’t find /var/backup and then filled up my filesystem drive so I had not freespace and I couldn’t figure out why for a couple weeks after checking all kinds of posts. I then couldn’t install anything since the drive was out of space, etc, etc. I ultimately had to gksudo nautilus then shift-delete the backups. I removed sbackup for now then will decide on my next plan of action. I hope this helps others that might come across this scary event. Much appreciate yr reaction donald. Simple but effective. It copies my /home partition onto the ext. harddrive and from there to my laptop as the ultimate backup. Maybe u want to have a look yrself, i can recommend it as an alt. for sback up. can i backup my system (9.04) and restore it to 9.10 ???. and when i upgrade to 9.10, does my app(from 9.04) die ? Hi. Great guide. Is this essentially the same as System Restore in Windows XP? This program is awful!!! It saved a pseudo-backup in an external disk which was not connected and filled up /media/, blocking my whole system. Smart, uh?